When you’re feeling overwhelmed with work or burdened with family problems, who do you go to first? Your friends. From discussing new business ideas to deciding which condo to rent, friends are often the first people we turn to first when we’re needing an honest opinion from someone we relate to and who we’re comfortable with. There’s a taboo that money shouldn’t be discussed, even with the people closest to us. The reasons range from personal insecurities to societal pressure to bragging avoidance, all of which have made personal finance a closed-lips topic that few people openly talk about. Unfortunately, this stigma hurts more than it helps – it makes it difficult for to expand your financial literacy, set reasonable salary expectations, and create realistic goals for your future based on the experience and realities faced by your friends. Bringing up our financial ambitions with friends is one of the easiest ways to start a conversation about finance. Similar to talking about our ideal travel plans or dreams for a beach house, most of us feel comfortable talking about our envisioned future with our friends. Take that conversation to the next level by asking finance-based questions about how they plan on achieving that ideal lifestyle with questions about their career and salary. Based on societal expectations on income and net worth, discussing salaries can be an extremely sensitive topic. Rather than inquire about the amount of money they make, ask about how your friends determine the value of their work in relation to their salary. Using their answer as a baseline can be incredibly helpful in determining your own financial expectations. This is a good opener because, if willing, it allows your friends to share more. The key to the phrasing is asking how they decided how much to invest, rather than just asking how much money they invest, which can be an uncomfortable question to answer. This approach allows for easy entry into a further conversation about how they invest, whether they prefer to manage their own portfolio, if they work with a group to manage their investments, and so on. The goal of the question is to learn about what investment strategies are out there in order to make more informed decisions for yourself. Bluntly asking about specific strategies or goals might feel intimidating for someone just starting up with investing. Instead, asking an open-ended question focused on education can kickstart the conversation and give you some inspiration for your own investment plans. Without a doubt, talking about money with friends is important for gaining insight, wisdom, and education to elevate your own financial decisions. Taking that idea one step further, you can invest with your friends and pool your knowledge, resources, and time together to make better, more informed investment decisions as a team. 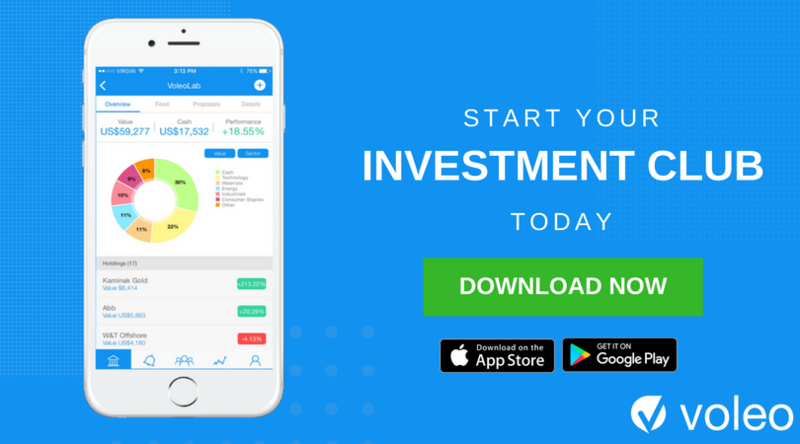 With Voleo, you can create an investment club with your circle of friends, collaborate on investment decisions, and build a team portfolio together.